Most have heard the term Web 2.0, though something equally as important is Art 2.0. Which is to say, with the total convergence of the visual arts–synthesized by an array of creative technical applications–the multiplying effects have become something entirely different and much greater than the sum of its parts. So for instance, the digital world has created programmers and software developers–career fields that never before existed in the entirety of human history. That in itself is stunning enough, but what happens when a illustrator studies anthropology and later becomes a programmer–also being an author? How do you define this? What do you call that person? We used to say multi-disciplined or polymath, but could it be that new language is required? I presented these questions and more in a recent conversation I had with Rob O’Neill, an Adjunct Assistant Professor @ Pratt and the current Acting Director and Research Associate in the Pratt Institute Digital Arts Research Laboratory. Having been a character technical director at Dreamworks Animation, on films such as “Shrek 2” and “ Madagascar, O’Neill is the author of Digital Character Development: Theory and Practice, and a founding partner of Kickstand: Animation Research + Development. RO: Thank you very much Max. It is a pleasure to speak with you. ME: In researching your website, I see that you are described as “an artist, programmer, and researcher working at the intersection of art and science.” That is a complex set of titles and skills, yet it seems increasingly to be the case that artists of the last century are slowly being equaled by the “Creative Technologist” of this Art 2.0 century. The language I use for this is TADAE, meaning Traditional And Digital Artist-Engineer. But I would be curious to know how you interpret this phenomenon—can it be distilled in a word? RO: I like the term “Creative Technologist.” And feel like it is the best term out there for this phenomenon. Though, I feel like it emphasizes technology. In animation production there is a constant call for the “technical artist” which is a flip of the term leading me to think that they are both describing a continuum but emphasizing one direction or another. Your TADAE concept is very interesting for describing the spectrum. For a long time I just called myself a researcher, probably when I was trying to figure out where the research would go. I think it’s actually transitory, and that in a few years we will be back to calling ourselves artists or engineers, because more of the boundaries will be stripped. Everyday we see more work done by people who are creative, who develop technology, who can distribute that work commercially, who promote the same result as fine art. I think we are working in an interesting time where artists are developing the tools they want to use in their work. This has been true throughout time but I think we are seeing a diversification of the types of tools artists are creating. Most digital artists rely on commercial tools, but it is the extension and augmentation of these tools, and the creation of new ones that really interests me and propels my process. I do not think it can be summed up in a word and I tend to describe myself differently depending on the context. Sometimes I say artist, sometimes filmmaker or animator. ME: So how about some background information, where did you grow up? How long have you been an artist? RO: I grew up in Brooklyn, NY and attended Brooklyn College (City University of New York) but did not major in art. I majored in Anthropology and Archaeology as that was my professional goal at the time. I studied human anatomy and evolution and took film and studio art classes along the way. I always considered myself an artist to some degree, drawing and taking photos was a natural part of my life and I knew an artistic practice would be a component of whatever direction I travelled. I worked for a time at the American Museum of Natural History (AMNH) researching the collections, and over time I realized that science was actually the basis for my art–that I wanted to create forms of visual storytelling. I found the stories reveled by nature and evolution to be fascinating, as were the stories from the history of science itself; subsequently developing a portfolio of work, which led to the pursuit of 3D animation. ME: In continuing to talk about your educational background, you left Brooklyn College and went over to Parsons…right? But also talk more about filmmaking, storytelling and 3D animation. RO: Yes, I attended Parsons School of Design, earning an MFA in Digital Design and Technology. There I was encouraged to explore themes of science and engage it with a more rigorous art and design practice. 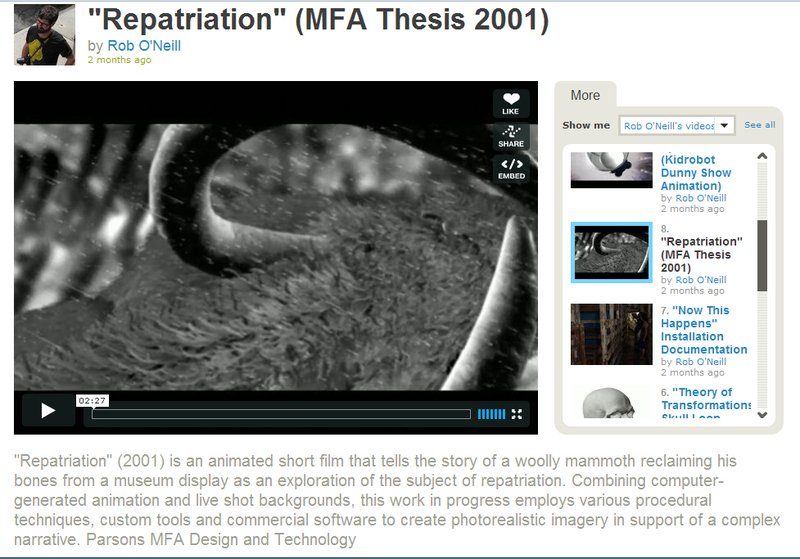 I created my thesis film “Repatriation” which was a direct result of my time working at AMNH and told the story of a woolly mammoth transported from his prehistoric deathbed to reclaim his bones from a museum display. It was during this time that I scratched the surface of many of the themes I still with today in my work: stories from science, imaginary/invisible/extinct creatures, and technology. ME: Were you a scientist before being an artist? RO: In a way yes, but only in the degree granting sense. As a child I never saw any distinction between the two. Art could be made about science, and used to document and explore scientific discoveries. It could also be used to document fantastical things in the same way. Over the years I would swing heavily from one side to the other and believed that I had to choose. As I grew and studied history, I realized that there was a time when that distinction did not exist. Now I realize that both art and science have a lot to learn from each other. I continue to read and study a variety of scientific topics including human evolution and paleontology as they are filled with amazing environments, unbelievable creatures, and fascinating historical characters that have been part of those worlds. They are also subjects that the public understands visually through the work of artists. 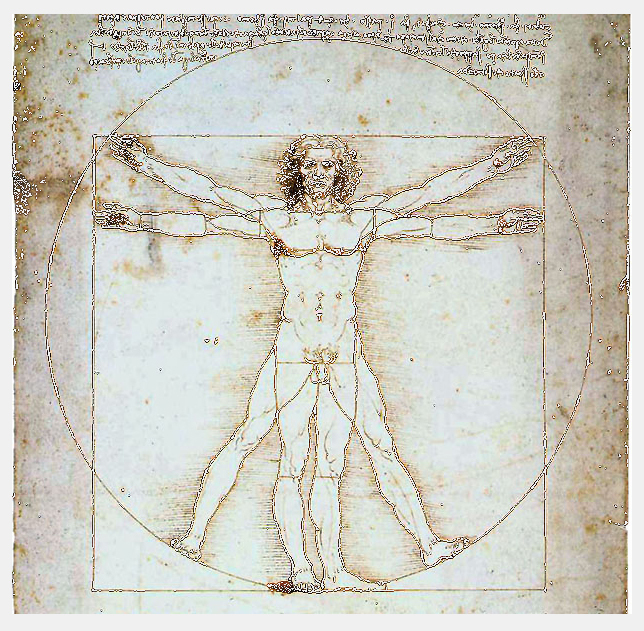 I wrote an article for Leonardo a few years ago that discussed how animation and the anatomical sciences have been deeply connected and how many anatomists are using animation software as research tools now. I like to believe that the science-art feedback loop is tightening. RO: Programming for me is the glue that binds my practice together. From stand-alone tools to extensions to 3D software I use code to create systems of artistic exploration. Sometimes these tools are created to handle tedious processes of batch manipulating files but more often I write tools that read and write datasets. These datasets are often historical, and more recently, are generated through simulation. Most of the tools are specific for a task relevant to my own work, but I have also released tools that I thought would be useful to others. Additionally, I developed an open-source animation production pipeline that independent animators and small studios use to manage production. Building this tool was a task that most people find dull, but I was curious about how to generalize the problem and decided to put the time in to build it. It is a tool that is not inherently creative in its functionality but eases the process of animation production some to pave the way for the real creative work. My first public tool was a plugin for Maya that allowed users to create an art directed flock or school of characters. That was my introduction to system programming and from there I was hooked. Another example was that I created an extension for Maya that allows an artist to export their 3d model for rapid prototyping also known as 3d printing. I have seen whole classes use this tool, at Pratt, where I teach, and elsewhere. Artists are using it to create amazing sculptures as well. ME: In a moment, we’ll talk about some specific work that you’ve done, but first tell me about your writings. I understand you’ve written a book(s)? RO: Yes, I wrote a book called “Digital Character Development: Theory and Practice”. It is a software agnostic look at the art and science of modern character setup for 3d animation. My education in anatomy and 3d graphics put me in a good place to become a character rigger for production animation. This is the process of taking a 3d model and creating all the bones that allows an animator to move it and the muscles for it to move appropriately. I was a character technical director at Dreamworks Animation on films such as “Shrek 2” and “Madgascar”. Dreamworks was an awesome place to work filled with brilliant people. As I settled back in New York and started teaching I realized that there was a gap in teaching materials that documented the “why” questions of character setup and everything was centered around pressing buttons in software. So I started the long process of trying to look at the theory of character rigging and generalizing the thinking about it. I feel like it is a great first step but there is much more to research and document. In addition to the book, I have written articles for Leonardo, Computer Graphics World, and spend a fair amount of time lecturing. ME: In listening to you speak, it really gets conveyed that collaboration is central to your overall creative process, which involves seamlessly intersecting scientific studies with artistically rendered, visual computations. 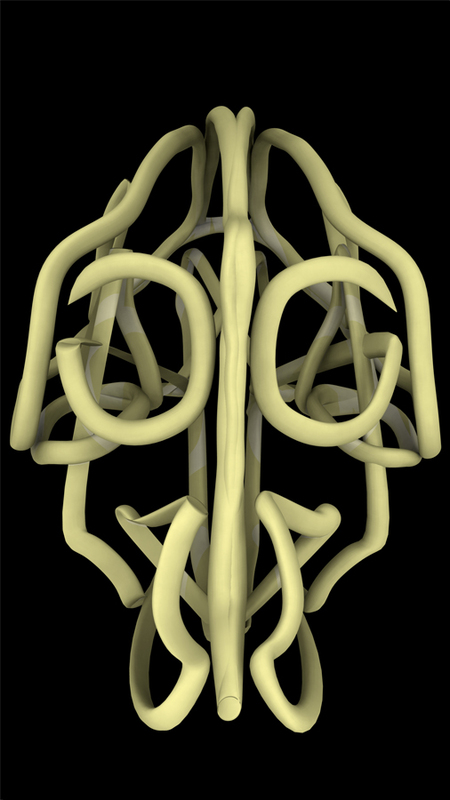 At this moment, I’m thinking about a project you’ve been involved with called the Morphology Research Project, which by looking at some of the imagery, resulted in the digital construction cranial forms. Could you talk about that experience…who and what was involved? RO: Collaboration has been a big part of my work even if I’m collaborating with scientists who lived in the 1800’s. 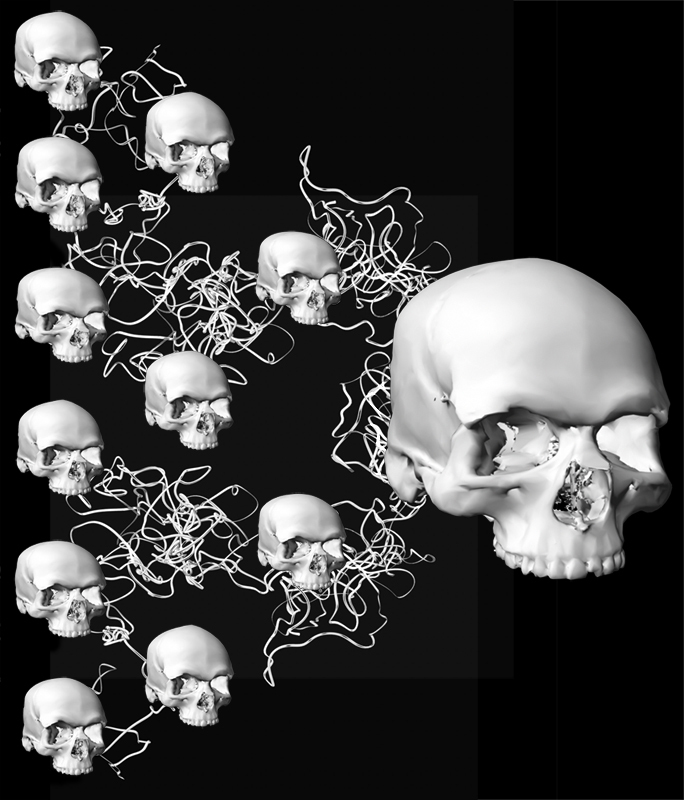 The Morphology Project was in many ways an artistic exploration of craniometrics or the measurement of skulls. It was a way for me to look at topics that had interested me in the past through the lens of art and technology. Part of the intent of the series was to explore historic techniques and theories and to take them to their furthest extent. For example, the biologist Darcy Wentworth Thompson outlined very visual theories to describe the relationships and differences between species by fitting like biological species in Cartesian grids and warping between them. So with this in mind, in “The Theory of Transformations”, I created replicas of his grids and placed 3D laser scans of a chimp and a human cranium inside them. From there I wrote code to warp them from one to the other based on Thompson’s illustrations. What I came up with was not as clean as his drawings but pseudo-species that are in many ways more interesting. I’ve presented this as a looping video and sculptures created from the transformed 3d models. Further along, I created a generative system that evolved a human cranium for generations in the piece called “DataFace”. I started with the database of measurements collected by the anthropologist W.W. Howells who travelled the world collecting a series of measurements on thousands of crania. I turned the data into a 3D hull, of sorts, which I then used to cycle through the measurements as analogies for genes which I then applied simple evolutionary models to see what would happen. It ended up having simple results that always just looked human because in the end human skulls are very similar and I had no viable means to introduce mutation. The work exists as a generative projection that is always unique – a sort of fast forward generational film of pseudo-evolution. The work always involved discussions with scientists to gain a deeper understanding of the data. Their insights were incredibly valuable and I tried whenever possible to give back to their work by creating custom tools and sharing my knowledge of 3d data with them. ME: And the series “dataProjections”, part of the Morphology Project, could you talk specifically about those works? RO: Although I didn’t plan to do a chronological series about different craniometrics techniques – that is exactly what I ended up doing. “The Theory of Transformations” was about two-dimensional deformation of shapes, “DataFace” was about shapes derived from a large collection of one-dimensional measurements, and “dataProjections” utilized modern three-dimensional point clouds. For these pieces, I worked with an anthropologist who was collecting shape data from a series of gorilla crania. I wrote a small tool to turn the data into paths. In watching him, I was intrigued by the gesture of the act of collection and I realized that the 3d stylus was actually capturing the path of his hand in action. So the pieces are digital prints that are drawings by a scientist seen through the tools I developed. My hand in it is the passing of light through the structure and creating a graffiti-like image on the wall, projecting the image analogous to the way that theories are projected from data. ME: Your website is called Morphometric, what does that mean? RO: Morphometric is the measure of shape. Scientists use morphometrics to do statistical analysis of natural forms. In many ways, artists are constantly measuring shape so it has always been a term that I felt worked on many levels and is a nod to my background. ME: I’m looking now at a video you created called “Cryptid Memior.” This film is described on you site as “the hidden nature of creatures studied by pseudo-scientific cryptozoologists.” What’s the interest there, and is your short-film a debunking of sorts? Is it meant to be humorous? RO: In the course of my work I looked into notions of fringe science, people who were studying things that might not have existed. Often they have as much evidence as researchers who are looking at creatures from deep prehistory. I also became interested in the use of photography and film in documenting or hoaxing so called cryptids or hidden animals. The film is totally meant to be humorous: I paint figures in and out of frame and use the classic Bigfoot footage as a means to create an Rorschach pattern. It’s a pretty blunt take on “what do we see in an image” and how it can be manipulated by tools or our own desires. This was a quick project but I would like to return to the themes. ME: I find it very interesting how digital technology seems to a gateway to self-discovery for so many people, whether they be traditional artist and sculptors, internet pioneers, architects, physicists, or in your case, an anthropologist. With that said, what would you, say to someone who’s of the belief that using computers to create art is cheating—that digitally created art is not art, or that it is less than “authentic”? RO; I think digital tools are just another medium, and while it might be faster to the end result or quicker to iterations, I think that honesty cannot be cheated. Honest work isn’t tied to any medium and can only be judged by the artist. The outside view is interpretation that can revel a lot about the work. New technologies will arrive and become old techniques but the good work will remain and be regarded for what it is. ME: In your article “Emerging Congruence between Anatomy and Animation” you talk about how the Disney Studios encouraged their animators to study anatomy. Later in the article, you also say that scientists are often called in to consult with animators. None of this surprises me. However, I do sense that a lot of people might not realize the kind of intellectual scholarship that is required for naturalistic mimicry in animation. In your role as an educator, do you find that to be the case? RO: Animation, in general, leaves the artist with a clean slate every frame – twenty–four to thirty frames a second. Whether depicting realistic or stylized imagery the animator gets little for free and everything must be created. When it comes to creating something realistic it’s really about observing the natural world and learning to recreate it smartly and with your own vision. It requires a deep understanding of the phenomenon that does not come from just watching footage but actually trying to experience it. As an educator, it’s about finding a balance between teaching process and giving students the tools to build anything they can imagine both conceptually and technically. The challenge is that every student is telling a different story with a unique set of challenges. So the scholarship, in the end, has to be self-directed but after a while you learn how to provide a framework that comes from being part mentor and part producer. ME: Earlier you mentioned your book, “Digital Character Development.” When was it written and how has it been received? Who is its intended audience, and what would you say that book has achieved thus far? RO: The book was released in 2008 after almost two years of research and writing, is intended for students and professionals interested in character technology for games and animation. The reception has been positive. I’ve heard good things from peers and from studios that have adopted it as part of their artist training programs. It was a great surprise to have it used to further train professionals. It was a really cathartic process to put all these ideas in one place and to give something to the community that I love being a part of. When it was done and published I was happy with the results but felt like it was the first step in a very long journey and that there is much more ground to cover. In many ways, it took a large chunk of experience that I had amassed and I put it into another form of memory. It opened my mind up to learning again, refreshed me to get back into production, and pointed me in some new directions for character technology, animation production, and creature creation in general. ME: As you and I both know, there can often be a heavy learning curve for mastering new technology. And yet, for those less familiar with digital technology as an everyday occurrence, what might you say to help that person move toward acclimating themselves with user-friendly experiences. Along those same lines, what would you say to a young person who’s thinking of pursuing a career similar to yours? RO: It’s impossible to learn new tools in a bubble – you have to have a reason, usually in the form of a project, to learn something. I’m a big proponent of learning by doing. The bar to entry for most of these tools is getting lower and lower on a daily basis. There are free tools that do what all the big commercial packages do so you can start learning hands-on without investing large sums of money. I think young people will have it easier as all these digital tools are commonplace. I was lucky to grow up in a household where we had a computer from when I was young so it has never felt foreign. Generally, I encourage younger people to seek broad educational goals and to mix their art classes with all the other subjects they might be interested in, so that they minor in geology or political science, for example, to try to wrap their head around a piece of the world outside of pure studio work. That interplay is where I work and it’s been a good start for me. ME: Rob, thank you so much for taking the time to speak with me. RO: It was really a pleasure Max, thank you. 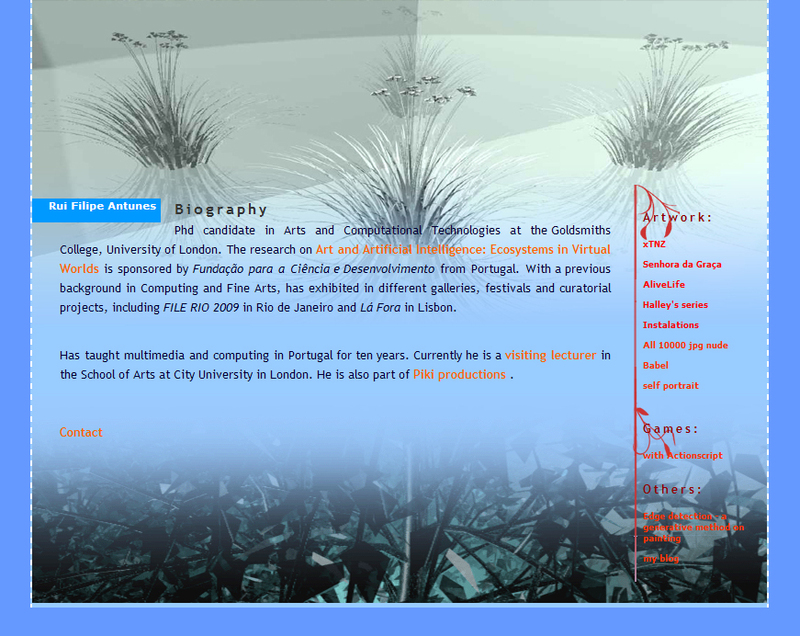 Artist, Rui Filipe Antunes, a Phd candidate in Arts and Computational Technologies at Goldsmiths College, University of London, specializes in the combined field in computing and visual art. 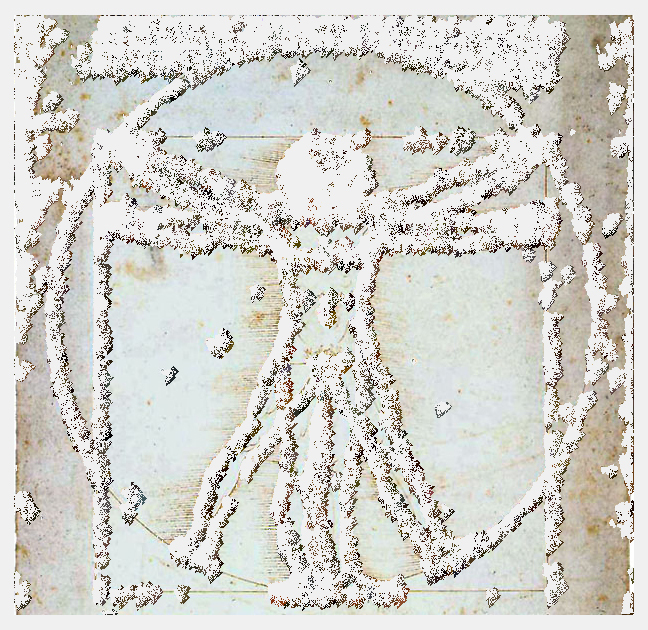 He has exhibited internationally in galleries, festivals and curatorial projects, including FILE RIO 2009 in Rio de Janeiro, Brazil. A native of Africa’s Southeast coastal nation–Mozambique, Antunes has spent most of his life in Portugal. And similar to other multi-disciplined artist/engineers and art educators featured here, like Dee Hood, Chris Ashley and Don Relyea, it’s not just that Antunes creates stand alone art for the wall, but that he has created in Cyberspace a website, which in and of itself is a work of art. Antunes is a life-long educator, having taught in Portugal for 10 years. Presently, in pursuit of his doctorate, his current educational station is as a visiting lecturer at the City University of London’s School of Arts. Recently, we met online for a chat. Max Eternity (ME): Hi Rui, welcome to Art Digital Magazine. Rui Filipe Antunes (RFA): Hi, I am the one who thanks you for this invitation. ME: You’re a Phd candidate studying in the Arts and Computational Technologies at the University of London’s Goldsmiths College studying art and artificial intelligence and ecosystems in virtual world, Do you know who developed this graduate program, and what will a doctorate in this field facilitate you to do in your creative career? RFA: As far as I know this doctoral program was designed by Janis Jefferies and Robert Zimmer with the intention of developing a creative hub, centered in digital studios, for artists interested in using the computer as an artistic medium. From my perspective I see this current program as the logical continuation of my personal research, which I have started during my Msc degree. When I first came to London, it was in the context of a visual artist interested in issues of interaction in installations, in a more physical computing approach. 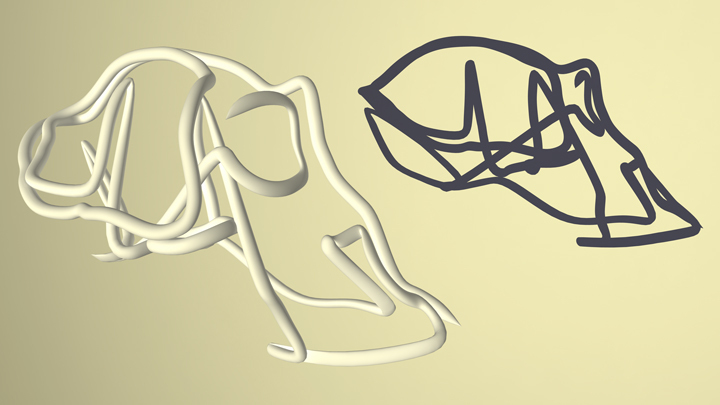 However, during the MSc period, with the influence of Frederic Leymarie, my current supervisor, I started developing an interest in 3D and Generative practices. 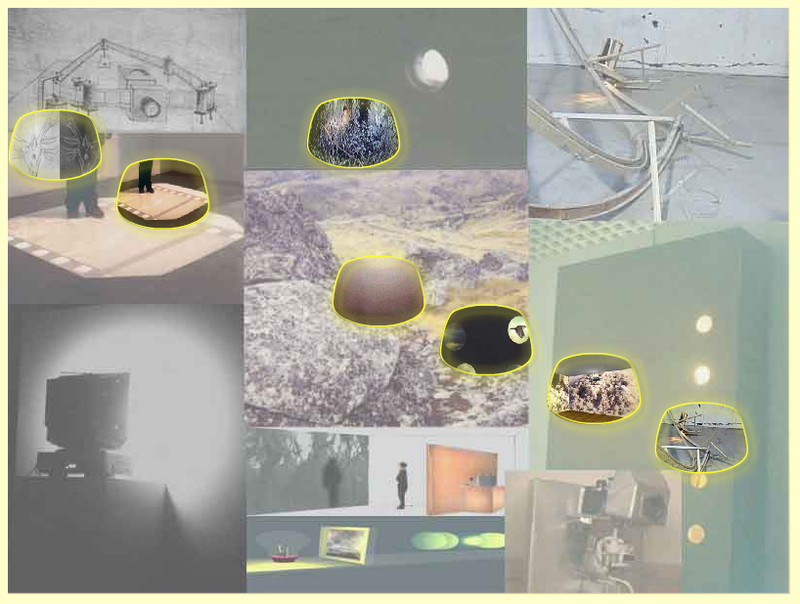 In particular I started the project of developing ecologies where the formal evolution of the visuals is promoted by the interaction of living entities. In terms of the future, my understanding is that virtual worlds offer a new paradigm in every sense: cultural, social and technological. In that sense, I am interested in their artistic exploration as I feel the richness of their intrinsic properties make them unique as a medium. This program will help me to develop an in depth knowledge assisting me in this project. ME: I understand you are a teacher, having taught in Portugal for 10 years. Is Portugal your birthplace? What class(es) were you teaching, at what school? RFA: I was born in Mozambique. However I grew up in Portugal since I was 5, after Mozambique’s independence. But I am a bit of a nomad, since even in Portugal, my family moved around. In Portugal I was teaching at a college, Escola Secundaria Marques de Pombal, to teenage students. I have always been a graphics guy, so I was teaching computing languages, multimedia and video. It was an intense and rewarding experience as the teaching team grew up together, becoming more like a family than a work environment. The same went with the students, mostly coming from problematic families, and making it difficult sometimes to detach the human and the professional sides of the experience. ME: You’re a visiting tutor at the School of Arts at the City University in London? What does that involve? 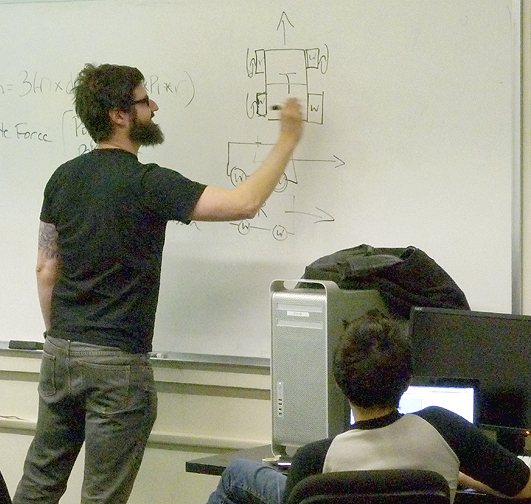 RFA: I am lecturing the two levels of courses of Flash and Actionscript. These are evening courses open to internal and external students. The courses vary depending on the class context, its level and learning pace. Since you can find students in very different levels, usually I use a workshop style, so on the side of the normal exercises students develop their individual projects. ME: I’m guessing that you’re multi-lingual? RFA: Yes indeed, there may be many gaps and failures in Portuguese public education, but an excellent policy is that everyone learns three languages, usually Portuguese, French and English. In my case I was fortunate since I lived next to the border with Spain a large portion of my life, and thus additionally I grew up with the Spanish language too. ME: Now, in looking at your website it’s clear that you have an interest in the natural world. Where does this come from, childhood? Were your parents environmentalist—naturalists? RFA: Yes definitely my childhood and first years as teenager are very influential. Sabugal, this village I just have referred to, in the interior north countryside of Portugal, next to Spain, was a small and safe place. We lived in close communion with nature. Everyone knew each other and thus we children were very free, and felt safe exploring all of the countryside around the village. All that sense of freedom and discovery was later lost when I moved to the city. So somehow I keep in my memory a nostalgia of these times as a magical and fantastic period which I continuously evoke in my work. ME: So let’s talk about your work. You created a group of Java based images called Halley’s series. 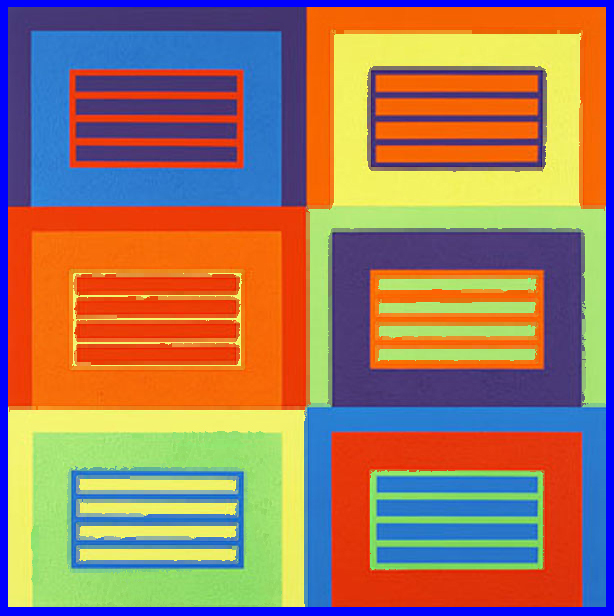 There are five different works involved, all quite colorful, with each consisting of overlapping squares and rectangles which dissolve and disintegrate. Visually it’s interesting to look at, but I have to say, I don’t really understand the title of the piece—what’s being conveyed? RFA: In a time where we are talking about virtual museums, this is a series of generative works that reflect on what it means to represent a painting digitally. 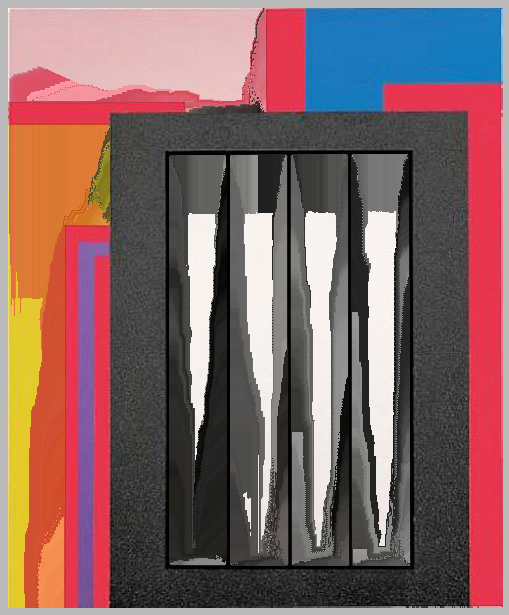 The idea behind it was to take the digital representation of Peter Halley’s paintings as a starting point, as they can be found on the internet, and make them alive. As such, some of the pixels which compose the images have some living agency and feed from the other pixels which are considered to be their nutrients. Thus when pixels search for food they reinterpret the paintings, changing their chromatic layout through their movement in the virtual canvas. ME: Oh yes, the artist Peter Halley. Though I must say, I like the Halley’s series in part because it reminds me of some of Josef Albers’ paintings, and to a lesser extent, his furniture designs as well. You may not have been thinking of this Bauhaus master when you made the work. Nevertheless, could you tell me about this grouping of work? RFA: Yes I am aware of your interest in Bauhaus. However there was no conscious choice of a particular school of thought. 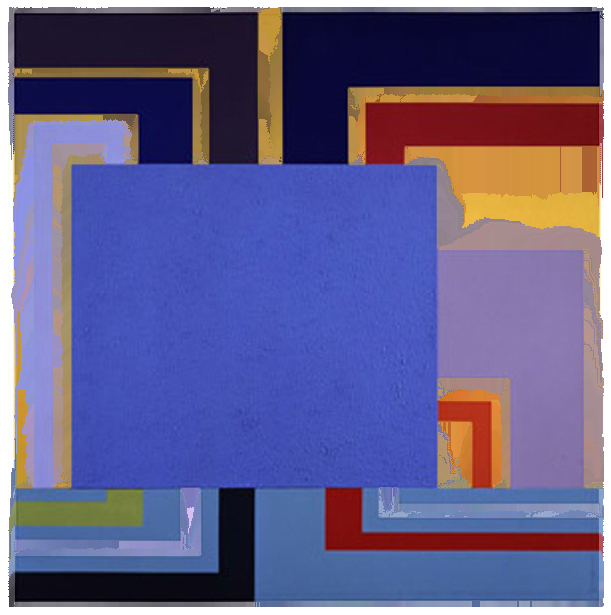 I have chosen Peter Halley due to his contrasting palette which seemed ideal for this approach in which the color intensity is what defines a pixel becoming a nutrient or an agent. Albers’ paintings you refer to might be a good starting point too. Actually now that you mention I might make a version of it in the future . . . it might be interesting. ME: Are you familiar with Digital Graffiti @ Alys Beach, Florida? I ask because I think you’re medium would be ideal for that venue. RFA: No I didn’t know it. I am not very familiar with the American scene. But I should definitely apply. ME: In your piece “AliveLife”, which by the way is a great title, you portray a very famous work by Leonardo DaVinci. That image, like the images in the Halley’s series, disintegrates as well. What does this mean? RFA: This work came immediately after xTNZ in a time when I was concerned with the representation of the body in the contemporary computer-mediated society. 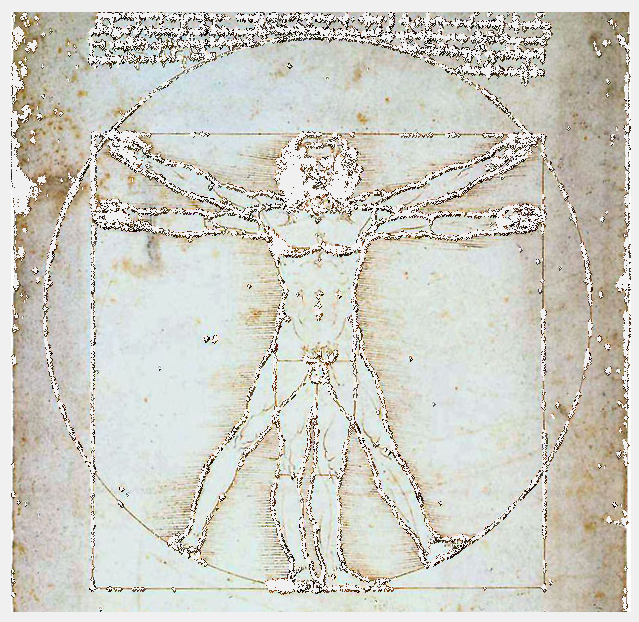 In that sense the Vitruvian Man from Leonardo looked to me as a masterpiece in the sense that it not only represents the body as it depicts the relation of man in the world during the Renaissance. In AliveLive I am resituating this image from a contemporary perspective. Once again, the darker pixels are alive and eat the lighter pixels which are the nutrients. However, here these pixels act as human skin cells, as they have implemented the behavior of the epithelium squamous. So somehow, in a very dystopian comment, the picture doesn’t disintegrate as you say, but it eats itself alive. ME: Wow, that’s intense. So, if you will, tell me about your experiences working with Java. Why do you choose that medium? Do you also work with flash, or other animation type tools? RFA: Java and Flash are great for being so scalable amongst different platforms and work well in the web. The specific choice of Java was my familiarity with the language due to some freelance jobs I had done before as a programmer and during my studies. When it comes to Java3d, it seemed a natural progression from Java. Actionscript became very solid and powerful in recent years with its version 3. I will probably use it as a preferential language for 2D works on the internet in the future. However, now as I am moving to 3D virtual worlds, I am considering using game rendering machines such as Unity3d, which at the price of loosing flexibility, provides many useful functionalities such as the physics engine. ME: In addition to the various Java pieces you’ve created, I also came across a very intriguing (mpeg?) video on you site, entitled “Senhora da Graça. It’s a film that moves like a mini-documentary, telling a story of nature, using surreal computer graphics. Could you talk about this project? What’s the meaning of the title? I think I understand the story, but please explain in your own words. RFA: Oh maybe it is not clear from the video, but Senhora da Graça is an actual virtual world. Somewhere in the website you may find a link to install it in your computer, and then you can play around with the creatures, if you like. In the village where I grew up, we used to go to a river to play about one or two miles away. Some years ago, they built a dam which flooded the entire valley. Senhora da Graça was the name of the flooded place and is also the name of the newly constructed dam. This work is a memorial to that place, where we grew up, and is built form images taken there around 20 years ago. The virtual world is inhabited by virtual creatures which form a virtual ecosystem residing in computers, which are ironically fed with the energy produced in the dam. All these creatures and shapes in the world evolve due to their interactions making the original images appear unrecognizable. ME: And similar to “Senhora da Graça”, a moment ago you mentioned “xTNZ.” I’ve watched it and I think find film is a rather beautiful, incorporating iridescent floral colors of fuchsia, pink, teal and mauve. These are all wonderful concepts…curious and interesting. And by the way, the music is quite lovely—magical, and the sounds fit the imagery well. So please, tell us about that intelligent film of yours. RFA: Thanks. I had the luck of working on this video with my wife, Joanna Pylak, a very gifted video editor who also worked on the sound. I will let her know your compliments. xTNZ is once again a video depicting a virtual world where creatures live and interact with each other, evolving in time. Besides that principle, xTNZ is a self portrait as everything you see and hear there are pictures and sounds of my personal body. However everything that is originally mine, or human, evolves by itself and according to their autonomous live and as such a digital autonomous evolution is performed. That is the reason for the title xTNZ, denoting Marshal McLuhan’s idea of the technology extending the body. ME: I came across your work while browsing the Rhizome website, which as you know is a new media, artists’ community. Though, you’re also in collaboration with PikiProductions, which I suppose is also a community for new media artist as well? This seems to be a trend in the digital arts community, with art being presented outside of traditional gallery spaces. Have you given this any though, and if so, how do you see traditional, commercial galleries evolving so as to stay relevant to the cutting-edge? RFA: Yes, definitely there is a generation of creators making their work outside of the traditional commercial circuit, and finding alternative ways for financing their careers. In that sense, however, it is interesting to witness that the inverse movement is happening as the traditional museums are slowly integrating these internet activists in special collections. There is no definite rupture I think; historically a similar process happened with performance art and anonymity in the arts from some of the kinetic artists. They were slowly integrated in the system. In the end it is all part of the art process. Personally I don’t see the medium as exclusive, rather as a technique. And as such, I use what I consider to be the best technical approach to convey the message I am pursuing in a particular moment. ME: Rui, it’s been great speaking with you. Any last thoughts you’d like to share? RFA: I am developing a new major scale project, a MMO, a virtual world dedicated to the former city of Lourenco Marques in Mozambique. Please take a look on youtube at the promotional video. You can find it under the keywords Lourenco Marques Project. I need several volunteers to help in the 3D modeling of the buildings. We are talking about rebuilding a city, so there is plenty of work to do. If anyone is interested please send me your contact to rui.antunes@gold.ac.uk . ME: Thank you. That sounds interesting. Good luck, and I wish you much success in your career. RFA: Thank you. I wish you all the best on this exceptional magazine and your personal projects.